Select Suspension Height Stock to 3" 4" to 5.5"
DOR's unbeatable short arms, made from 2" OD 1/4" wall DOM tubing on both upper and lower arms, and with our industry-best greaseable bushings, you simply will not find a better quality short arm anywhere at this price. These are beefier than arms than cost twice as much, and are precision cut, notched, and welded all in a jig for incomparable accuracy. These are the straight arms for 3rd and 4th gen trucks, from 2003 to 2012 (and the 2013 Ram 2500 models that do not have radius arms). If you have factory wheels and larger/wider tires, you might have some minor rubbing when turned at full lock. These work best with wheels that have more offset than stock, preferably more than 5.5" backspacing (for 8" wide wheels). If you are unsure if your tires will rub or not, it's a good idea to order our offset short arms, which can be seen below in the related products. They will not rub with any wheel or tire configuration that we have seen so far. These arms are made to order so please make note of the build time posted at the top of the page. Build times are not guaranteed but we do our best to knock them out as quickly as possible. All arms are made to push the axle 1/2" forward of the stock location for more tire clearance and better suspension and steering geometry. The actual measurements vary based on lift height so please make sure you select an accurate suspension height when ordering. These arms are powdercoated gloss black. 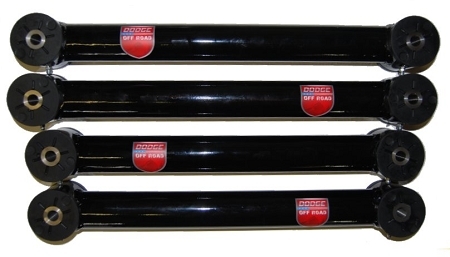 If you have more than 5" of suspension lift, you will really benefit from our long arm kits. Even though we make the short arms longer to compensate for the additional lift height, long arms are the real answer to improving ride quality for lift heights above 5". When listed in stock, that is for the stock to 3" length only. All other sizes are built to order and take 5 to 10 business days to ship. Copyright Dodge Off Road. All Rights Reserved. eCommerce Software by 3dcart.